Marks and Spencer do it again! With Marks and Spencer launching a new gluten free range, called Made Without Wheat, I just had to pop into town and check it out! Although the store in Barnstaple only stocks a small range of the products, the staff were really helpful and printed out a whole list of every product which is gluten free in the store! Moist, Chocolatey Heaven in the palm of my hand! As usual with Marks and Spencer, the food looked a cut above the rest. First on my wishlist were the chocolate muffins, which looked so good I had to eat them in the car rather than wait til I got home! 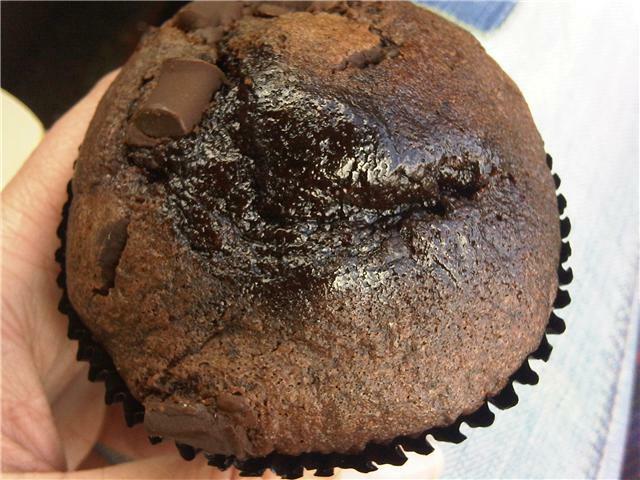 Stuff with huge chocolate chunks, this muffin was so moist I couldn’t believe it was gluten free! Unlike the dry alternatives I had tried before, these muffins came top of the list. The cake was bursting with rich chocolatey flavours, and they certainly didn’t skimp on the size! Sitting in the palm of my hand, I really knew Marks and Spencer has got this perfectly right. I can’t wait to go back and grab something else from the shelves! This launch must have been well heard of as the shelves were already half empty – better run down and try these muffins soon, they’re too good to miss! Oh my they look soooo good! I want to try one!!! Sounds fab, will go and get a list from store tomorrow. Already love their chocolate and cherry cake. and the chicken and mushroom crispbakes are lovely too. don’t like the bread though, the rolls were horrid. does anyone knolw if the souper green soup contains gluten please?